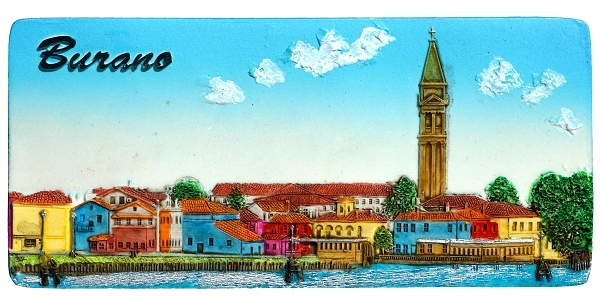 Ceramic embossed fridge magnet featuring panoramic view of the Burano waterfront. This is the view you see from the municipal ship when sailing from Venezia along the Cemetery towards main entry point at the island of Burano. This is the place where municipal ships cross when coming to and from Burano. Perfect memory of your trip to the Venetian glass factories to be put on the door of your fridge.